I am very happy with my Simple human bin liners which fit my bin made by the same company. Prior to this tried without success to find this size at various London department stores - John Lewis, Morleys etc. The only reason I have given 4 instead of 5 stars is because a pack of 90 liners seems rather a lot and I would have preferred to have had the option to have bought less liners. I am so pleased with these bags they have never leaked out and they don't split, so strong. This bin/liner combination is ideal for collecting wet /soiled nappies for disposal in a sanitary waste collection. Been using these for many years ,they fit the bin perfectly and having the internal ties the contents are sealed within the bags. My family have also found many other uses such as packing shoes when going on holiday. These are a perfect fit for my new step can. Superhuman liners are the best to fit their products. These liners are the BEST! I am 76 and due to an old bladder, I need to use Poise Pads...which are also great and needed by most women my age that have given birth. I have a small Simple Human can in both bathrooms. With the liners, there is no urine smell in the room and when full, they tie up tightly and go in the garage trash can for disposal. They are a real necessity. the bags don't fit very good, I have to tape the bag in the liner so it doesn't show on the outside of the can, I have tried everything without the tape but the white bage still shows, I would not buy this can again, I wish I hadn't bought it in the first place. I won't buy the bags again. Can liners do not fit. They are just a tad too small to fit properly.And because they are too small, I don't get to fill the whole can liners if I so choose. These liners do not fit this can at all!! I tried to return, but too late, your company won't accept my return at this date. I have a awful time getting the liners in the can so they don' show. At this time I not sure I like the product. If you could give me some ideas I would surely appreciate them. Great liners easy to tie up and dispose of. These bags are absolutely wonderful. They dont break or split and keep their shape.Thank you SimpleHuman. As far as trash bags go, it is one. Not sure it's something I have or ever will have any thoughts regarding beyond a neutral acceptance of their existence. If you're looking for trash bags, these are some. So are others, though. Lots of choices. I love using these fitted instead of grocery bags. Looks nicer and perfect fit. I hadn't ordered in a long time and did notice the bags may be a little smaller than the other ones I already had, but they still fit. They fit perfect for our new trash can. Love Simple Human products!! 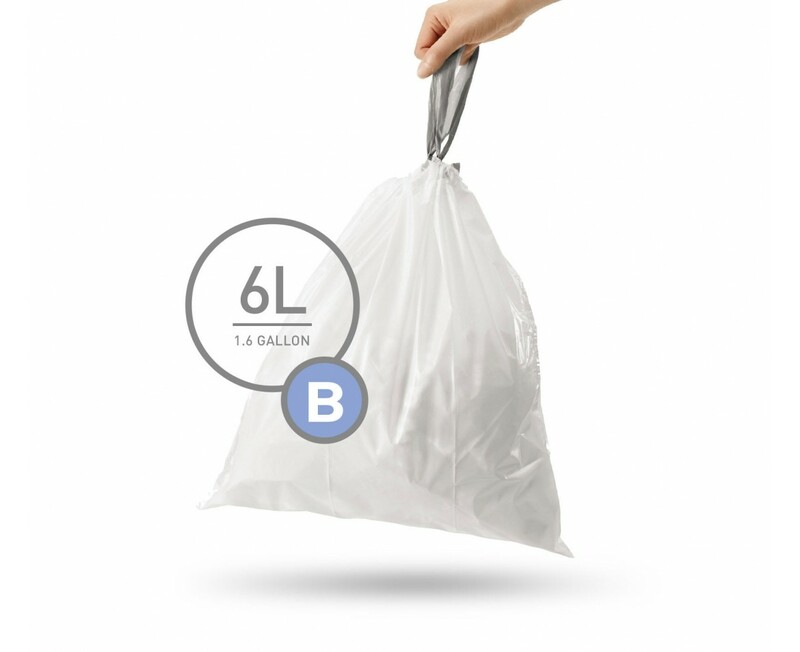 I find the code B trash can liners (bags) to be of excellent value and quality. 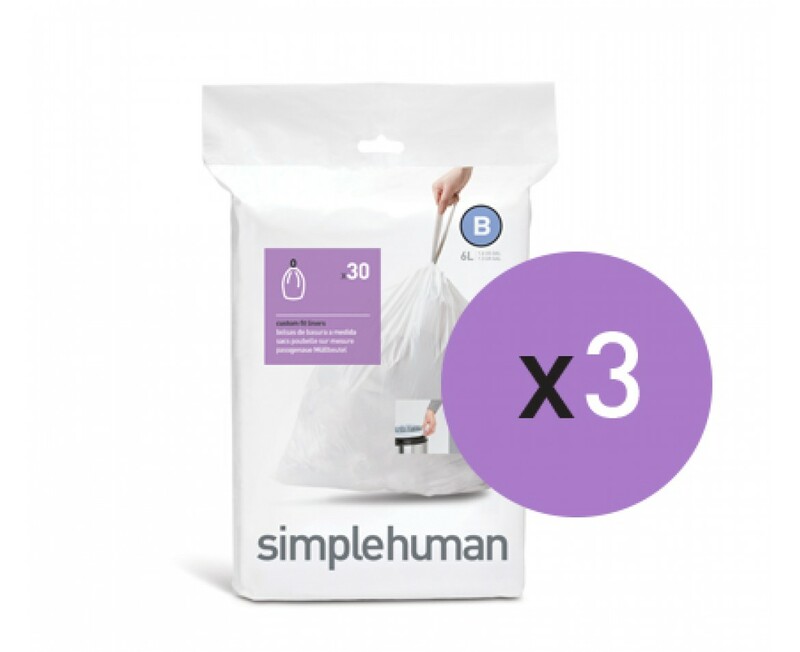 the garbage bags from Simple Human are strong and clean. if you will decide to buy, make sure it suits to your garbage can. i will recommend this product. I love these liners. I bought them for a particular small stainless steel garbage can. I found out they also fit other waste baskets. I'm a happy camper! Love these bags! Not only are they great for the bathroom but they are exceptional kitty litter bags too!!!! I use these daily when cleaning up my cat's litter. I have been using these bags for years for their convenience, thickness, and odor control. These trash can liners are really lovely. They look tidy and tuck away out of sight.They are sturdy and they look nice. I love them!! easy to maintain, don't have to use unsightly plastic grocery bags. replace each week. easy to use and fits well with the can. - great! Nice looking , perfect fit , easy to remove and tie up, can't use any other bags -addicted to SH liners. I have a small circular step-can basket for the bath. Generic liners look horrible- they hang over the side of the can. This liner is perfect. all simple human liners and trash cans are top quality. I wouldn't buy anything else. I love my trash can its the perfect size. It's a small silver trash can and it's finger print free. It's easy to clean and it is very durable. It fits perfect under the bathroom sink or next to the toilet. Fits my can perfectly; strong enough to be filled with cat sand clumps. The simplehuman® bags I ordered are a nearly perfect fit, as advertised. They do show outside the simplehuman® pedal bin slightly; but not like the generic small, medium, and large bags I would've otherwise purchased locally. I replace my bags weekly. I haven't had one tear yet; so, apparently, they're quite durable. The only reason I gave four stars instead of five is because I believe there's always room for improvement. I like the size of the trash can and the liners and I use it everyday under the sink in the kitchen. It is durable and made well. It is very nice and I would recommend it to friends. Great product.....works well with bathroom, and the bags fit great! The size is perfect, but more than that, is the strength of the bags. I only wish the bags were available in every store. 7/21/11 Thursday Purchased the bathroom silver finger proof container w/liners. This is what I have been looking for in container & liners. Did order, additional liners. This is an excellent product & liners. It is great having a bag that fits the container perfectly. Just pull it out and tie it up. I keep the extra bags under the liner so they are convenient. The liners fit perfectly, are strong and well made. I use them in the bathrooms and laundry room. Very pleased with them. it's neat, it's easy. it matches. worth it. The aspect of simplehuman bags I've always liked is their quality; in construction (very well made), in specification (they are usually a very good fit) & in appliation (they're very well suited to the tasks they're made for). The dust bin ( trash bin ) is robust and well presented; a very attractive design. The size is perfect for our use. These liners, as described, are the right size for our mini plastic step trash can. They are strong and the drawstring closure is very convenient. Much better choice than trying a generic liner. Fits the bin perfectly, had trouble finding this size elsewhere. Like the ties when binning it. It fits the garbage can great. I have been using this product in our "Pooper Pail" outside step can for 7 years now. It's an easy way to dispose of waste from our very large dog. I have noticed that the plastic is a bit thinner these days compared to 7 years ago, (it's at the acceptable limit),but not so thin that I would stop using them. The self contained tie closure is nice too. I bought trash can because of size and style, and bags to use with it. I am very happy with my purchases. the product is fine. however , i'm partially disabled and if the bags were a little wider, it would be easier for me to put them in the container. What I like most is that the bag fits perfectly inside of the can, and that it is very easy to insert & take out. simply marvy! My owners really like it. Me, I'm a dog! These 6 liter trash liners fit my Simple Human metal bathroom trash cans with plastic tops excellently. They are easy to install and remove, and do an excellent job holding bathrom trash. I also have had a large kitchen Simple Human trash can with Simple Human trash liners for over a year now, and the kitchen trash can and liners also works excellently. simple ordering procedure; rapid delivery. Durable, light liners that are almost revolutionary in terms of strength and weight. I recommend ordering a back-up of as many as posssible as they take up so little storage space, and are so versatile. For example, I keep a box in my upstairs den, an extra few boxes in the linen closet, a few in the garage, etc. One of the problems with many waste bins is that liners never fit properly. That is why these liners are very good. They do the job well and do not make life difficult for the user. These little bags are adequate. They're a bit thinner than Size C, which I used for another basket. They're also tight at the top. With a little more circumference, the lid would keep them in place, or that really nifty bag tuck thing with the Size C basket would help. These bags could be maybe an inch longer. That said, I'll continue to reorder cases of these as needed. The basket fits in here just right. I like these liners as they are made to fit the simple human trash can perfectly. They do have the "cinch" handles, and that makes it easy to grab them and go. The can itself is a nice shape and also fits perfectly into the space it is for. I particularly like the drawstring style can liners/trash bags in this size. They are great for cat poop! I have been looking for small liners like this for some time and was lucky enough to find them included with the trash can I purchased. It too is perfect for use in collecting cat waste as it has a hinged lid. I am so very pleased with my simplehuman trash liners. I no longer have to struggle with trying to make oversized plastic bags fit my trash can. I've found the perfect fit and I'm simply satisfied. I can always count on receiving quality product from Simplehuman. It's just not worth it to go back to other "comparable" products. I purchased the mini covered trash can for my bathroom. Now my dog can no longer raid the garbage! I like the fact that I don't have to "look" at the trash in the can. I like the liner and the way the bags fit perfectly and the whole thing just slides right in. These work great. Super strong and they tie up nice and tight. Perfect for our trash can.